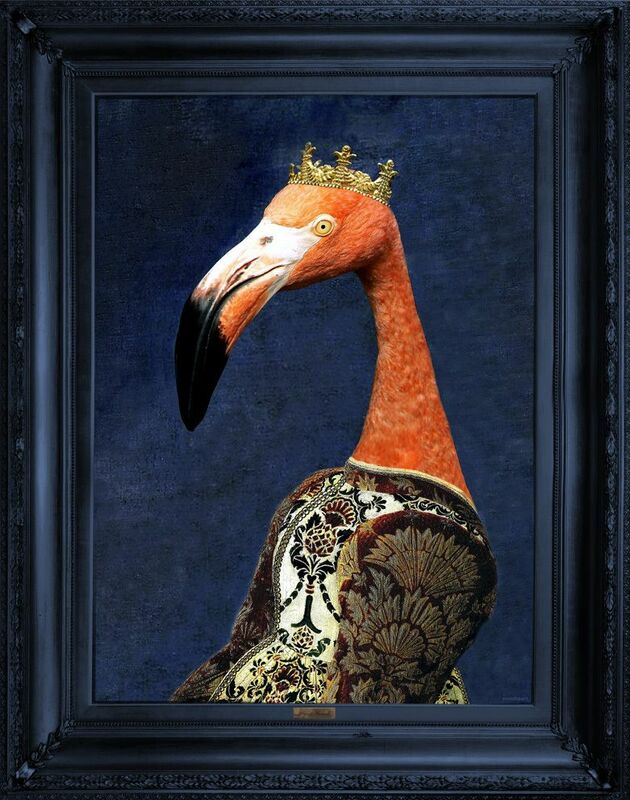 Surely the star of anyone’s personal menagerie must be the statuesque flamingo and Princess Flaminia looks magnificent in a velvet embroidered bodice, her bright pink plumage glowing against the dark blue background of this portrait. Surely the star of anyone’s personal menagerie must be the statuesque flamingo and Princess Flaminia looks magnificent in a velvet embroidered bodice, her bright pink plumage glowing against the dark blue background of this portrait. Flamingos have been popular motifs in interiors for centuries and this surreal portrait by Angela Rossi will make a statement in a contemporary or vintage setting. Made in England.